Background: The skin, being the outermost layer of our body, is constantly exposed to oxidative stress induced by UV-radiation, pollutants, smoke and xenobiotics. To counteract the deleterious effects of such exposure, the skin is equipped with a complex anti-oxidation system, involving both exogenous and endogenous antioxidants. As low molecular weight antioxidants undergo depletion in counteracting oxidative stress occurring in the skin, topical supplementation with these agents is regarded as a suitable strategy to restore skin oxidative balance. Unfortunately, most antioxidants show unfavorable physico-chemical properties (e.g. excessive lipophilicity or hydrophilicity, chemical instability) that strongly limit their skin penetration and hence their effectiveness after topical application. To overcome these drawbacks, nanocarriers such as liposomes, niosomes, nanoemulsions and nanoparticles have been widely investigated as dermal delivery systems for antioxidants. Objective: The present paper will review two different types of lipid-based nanocarriers, solid lipid nanoparticles (SLN) and nanostructured lipid carriers (NLC), which represent the latest innovation in the field of nanoparticles designed as topical drug delivery systems. The effects of loading different topical antioxidants into SLN or NLC will be examined along with the usefulness of these antioxidant delivery systems in improving skin defenses against oxidative stress. 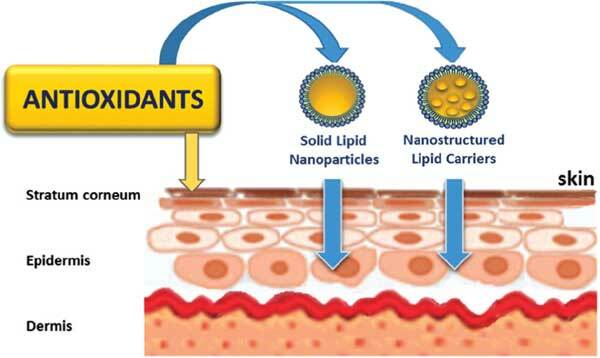 Conclusion: In this review, recent studies regarding ability of solid lipid nanoparticles and nanostructured lipid carriers to improve dermal delivery of low molecular weight antioxidants have evidenced that these carriers show technological properties that make them particularly useful for topical delivery of antioxidants, both in pharmaceutical and cosmetic field. Keywords: Antioxidant, dermal delivery, solid lipid nanoparticles, nanostructured lipid carriers, skin penetration, drug delivery systems. Keywords:Antioxidant, dermal delivery, solid lipid nanoparticles, nanostructured lipid carriers, skin penetration, drug delivery systems. Abstract:Background: The skin, being the outermost layer of our body, is constantly exposed to oxidative stress induced by UV-radiation, pollutants, smoke and xenobiotics. To counteract the deleterious effects of such exposure, the skin is equipped with a complex anti-oxidation system, involving both exogenous and endogenous antioxidants. As low molecular weight antioxidants undergo depletion in counteracting oxidative stress occurring in the skin, topical supplementation with these agents is regarded as a suitable strategy to restore skin oxidative balance. Unfortunately, most antioxidants show unfavorable physico-chemical properties (e.g. excessive lipophilicity or hydrophilicity, chemical instability) that strongly limit their skin penetration and hence their effectiveness after topical application. To overcome these drawbacks, nanocarriers such as liposomes, niosomes, nanoemulsions and nanoparticles have been widely investigated as dermal delivery systems for antioxidants.